This afternoon after watching Charley Bejna cross under the Burled Arch, I made my way to the library to catch Martin Buser speak about his journey across Alaska. The one topic which kept coming up in conversation were the connections made and the emotional highs and lows. No matter how many times you hear a musher speak about the trail, one cannot comprehend what a musher goes through on the Iditarod trail. No matter if a musher finished 1st, 31st, or scratched, they all have one thing in common; they all have overcome a monumental challenge. 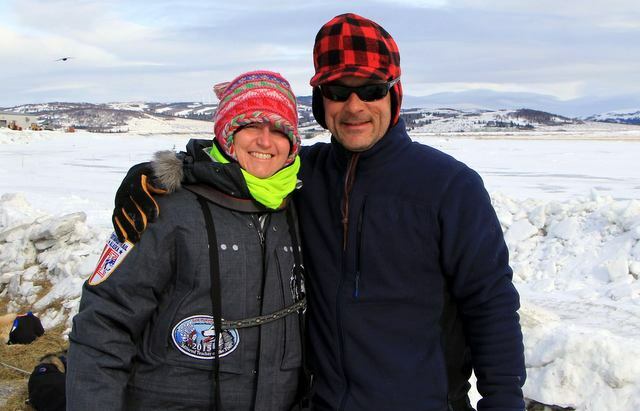 The stories they have are incredibly personal to each musher. It takes many mushers a great deal of time to really process their journey and share some of the stories. Some will never share their stories as they want to keep each and every moment their own. Martin was kind enough to share some of his stories with us. Martin explained while out on the trail we all experience the highest of highs and lowest of lows. Just as you are hitting that low, boom, you are struck with an unimaginable high. 18 years ago Martin met a women who asked for him to pose for a picture with her baby son. 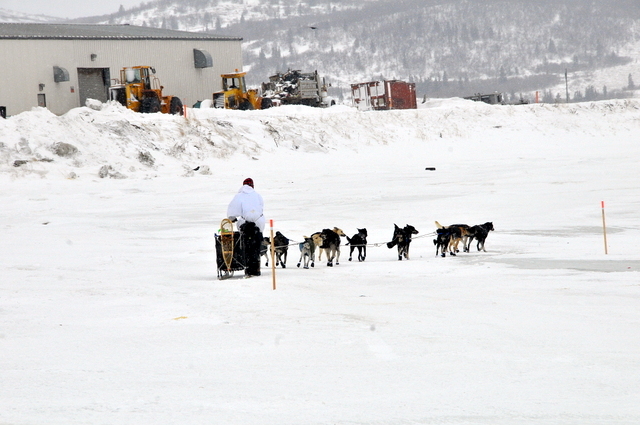 Martin being the friendly and thoughtful musher he is, posed for the picture. While he was in Shaktoolik this year this moment came full circle. He noticed a full-grown 18-year old man coming near him. He explained to Martin who he was and asked to recreate the picture. Martin was more than willing to recreate the picture exactly how it took place 18 years ago, this time Martin holding the original picture. 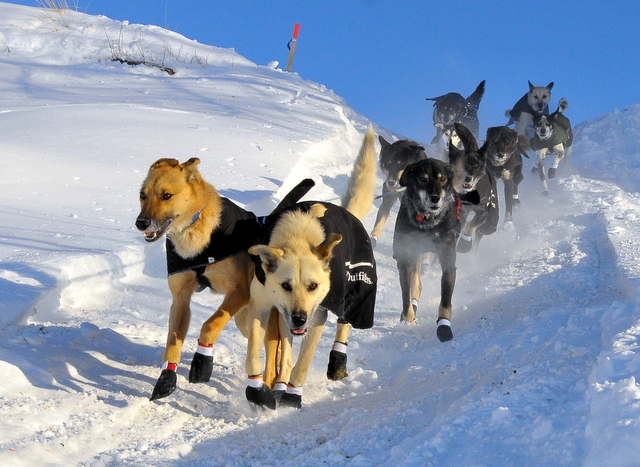 These are the reasons mushers are so adored. Martin was impressed with the Huslia checkpoint; he actually named the route through this checkpoint the Attla Loop. He went on and on about the friendliness of the all the people in the village. As he neared the checkpoint he started noticing cardboard signs made by school children. I remember seeing these, too, as I walked out the trail a ways. It was during this point of the trail Martin was feeling awfully down on himself. He came to one sign that read, “We teenagers look up to you.” This sign was so powerful to him, in fact, it brought tears to his eyes. He began thinking to himself, “I cannot let these kids down, they are our future.” Martin began to reevaluate his race strategy. When Martin started his own kennel, he thought long and hard about the name. With his philosophy being to have happy dogs, he decided on the name, Happy Trail Kennels. In Huslia, he began thinking if he truly had happy dogs at this moment. This is when he changed how he would run this year’s race; he was going to make sure he finished with happy dogs. Martin continued to speak of the connections he has made along the trail. Sometimes you form these connections because you have the courage to engage them in conversation. There was a young man who kept hanging around and watching Martin do his chores during his 24-hour break. Finally, Martin decided to break the ice and ask the young man about his deformed face. He learned a great deal about this young man. They became very close as a result of this. All it took was a question. Martin finished his talk by speaking about pride. We all have unique experiences which make us proud in our own ways. None of the things we feel proud about came easy, we all had to work for them. He also mentioned you are going to have to feel lows in order to feel this sense of pride. No matter what, we can all overcome these lows and become proud of what we do. I was extremely proud to have witnessed Martin feel proud of what he does. I witnessed him sign autographs, interact with children, smile for pictures, and be a commendable representative of the Iditarod.